Manitowoc, WI- Dramm Introduces the a new line of cutting tools for both professional and home owner use. The new Pruners and Shears are durable, made from forged stainless steel with comfort grips and a lock to keep the unit closed. A durable sheath with a belt clip is also available for use with either product. 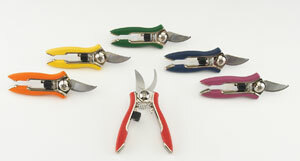 Available in six different colors, the pruners and shears are sure to attract attention and be a big seller. 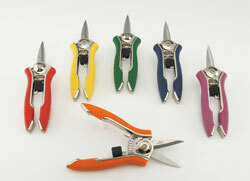 Sold in retail packaging and shelf-top boxes or individually for professional use, the shears and pruners will be available Fall 2009 from Dramm distributors world wide. For more information on Dramm's line of cutting tools, contact us at the numbers to the left or by email.